May your Hurts turn to healing; Your Heart embrace Feeling. May your arms Never Tire. We are the light bearers, the evangelicals, which literally means those who bring a good word, a word of hope, a word of healing. And there is so much need for light bearing, for the good word, the word of hope today. John 1 tells us that just over 2000 years ago a light came into the world; a light that would change everything, a light that came into darkness. This Lenten season we have been talking about our own darkness, our own desert journeys. There is plenty of darkness, plenty of wilderness and shadows to explore, to get to know. It’s important to know our own shadow side because then we can take responsibility for it, we know it when we see it and we won’t find ourselves pretending that it belongs to someone else. Holding our own weakness tenderly we can also be gentle with others. We can remember not to judge lest we be judged, we can refrain from throwing the first stone. This week I heard Toni Morrison in an interview talking about racism. “it’s insanity,” she said, “it’s the need to see someone else on their knees so that you can feel OK.” It’s not black people who have work to do on racism but all who are racist. The reaction to the Black Lives Matter movement says a lot more about those reacting than it does the protestors. Do we really want to say that Black lives don’t matter? We must look carefully at our own shadow, our own darkness if we are to be sure that we are dealing with it, that we aren’t pretending that our darkness is really only a reaction to what others have done, is really justified. Our darkness, our shadow side, properly cared for and transformed by the Holy Spirit becomes fertile ground. It becomes that place where we have empathy for others because we know how hard this work is. We know what resistance looks like. We know the resistance because we can and we do overcome it! We know it because it is that urge to not do anything, to let someone else take care of it. We know it because we want to deny and defend and justify why we acted or didn’t act. We know it because we can bring the light of Christ to it and watch it change. This transformation is that glorious moment when you realize you can and you do make a difference, sometimes just with a smile, with recognition, a way of saying to others, I see you and I care. 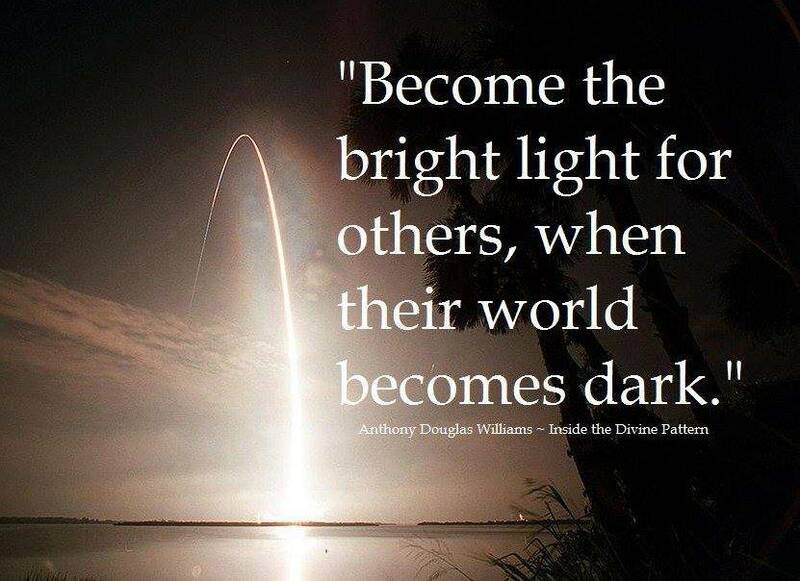 Seeing others truly we bring the light of Christ to them. “Beloved child of God, you are treasured, you are loved eternally and no one and nothing can ever take that away.” And the shadows lift, they dissolve. We can see our shadow side leaking out when we see our nation mourning the brutal death of Kayla Mueller; who looking like everyone’s next door neighbor, was killed by ISIS and how quickly this was followed in North Carolina by the murder of three innocent Muslim students, who looked like “others” and the burning of a mosque in Houston. This is our shadow, come back to haunt us. It is out there when we hear news commentators crying out for the murder of all Muslims and there is no accountability for the American participation in the creation of ISIS. This is shadow work at its deepest and darkest. It’s hard to look at and if we really consider it, let it sink in, it can make us feel sickened and hopeless. It is into this we must bring the light of Christ. Bring the light of Christ into our anger and pain. Our resistance to dealing with our darkness shows up when we hear people deride Obama for saying that Christians have committed atrocities too and we need to be careful how we judge others. We have quickly forgotten the Christian militias that terrorized thousands in Central Africa just two years ago, where more than 6000 were left dead in an ethnic cleansing, or the Christian justification of slavery that happened right here. Not us, we want to say, we would never, all the while students are shot and mosques are burned. It’s so much easier to see the wrongs, to see the shadow in others. Not us, we protest, we couldn’t do that. Bring the light of Christ into our sorrow. We feel our resistance in the silence and the turned gaze when we don’t want to see our neighbors in poverty or pain. When we want to walk by and not see, not know. As if to know would implicate us, would drag us into their situation and it feels too big, too scary. Bring the light of Christ into our fear. It is into this darkness, the darkness where might makes right and the powers that be can be as vicious and brutal as any we have heard of, it is into this darkness that a light has come. Light of Christ come into our most hopeless situations. A light that cannot be overpowered. This light that cannot be overcome, it cannot be eaten up or digested by the darkness. It sticks in the craw of the darkness and no one and nothing can swallow it up. This light changes everything. This light which will not go away illuminates our very being and we are seen, truly seen and perhaps there is a piece of us that fears this, that says “if you really saw me, truly knew who and what I am, you would not like me.” It takes courage to stand in the light and be truly, wholly seen. All our mistakes and shadows visible. We are human, faulty and frail. We are human, bearers of the image of God, created good, so very good, and faulty and frail. Both are true. The light of Christ transforms our darkness, our human soil into the richest of compost, into the fertile ground of compassion and abiding love. Pain that isn’t transformed, is transmitted and so we mourn with those who’s pain continues to live in them, who’s pain continues to isolate and distance them, those who are afraid to stand in the light of Christ because they are so sure that no one could ever truly love them, not after all they’ve done and been. We mourn with those who cannot bear to look at their own shadow, their own darkness for fear that it will all be true and it’s too big, and it’s too scary. We bring the light of Christ to those who are lost in the darkness when we tenderly hold a safe space and invite those who fear, who rage, who hurt to dare to show up wholly and completely. We bring the light of Christ when we look past the painful behaviors and say I still see you, I still see you, child of God and God still sees you. You are treasured, you are loved, you are forgiven, you are made whole. We bring the light of Christ when we love ourselves wholly and completely, all our faults and mistakes, and we honor our faults because they keep us human and keep us reachable. Can we say to ourselves, I see you child of God and God sees you; you are treasured, you are loved, you are forgiven. We mourn and cry out against the darkness, the lostness, the injury and pain, but we don’t leave it there. We are called upon to bear the light of Christ into that darkness, into all the pain and lostness. We are called to show up fully, frail human, beloved child of God, and be with those who suffer. We are called not to judge but to be with, not to correct or fix but to love. Mourn then and cry out, and rage against the darkness, but don’t leave it there. Go forth as the light bearers, as the image bearers, as the messenger of God and speak a word of hope, of truth, of light into the darkness. Look deep into the darkness, because we might find part of ourselves there, some piece long forgotten, because we might find our sisters and brother there, and love deeply, love knowing that the darkness is the first wrap we put on our wounds, tucking them away when they are too painful for us to bear, to hold gently, tucking them away with the promise that we will release them soon, as soon as we can breathe through it and know we’ll survive. Love gently and deeply because sometimes, when we have covered a wound it is just to easy to let it stay covered and to refuse to heal. Love deeply because this is what it means to bring the light of Christ into the darkness; not a harsh, glaring, exposing light, but a soft, tender, loving light, a light which heals. And so yes, kick, moan and scream if you need to but don’t ever give up. Know that God is with you. And when you can’t feel God’s presence it is right to mourn, to cry. Go into the darkness, because you bear the light of Christ with you, because you are the evangelist, because you bear the image of God in your very being. Go into the darkness because you are loved, you are treasured, you are never forgotten but loved eternally and no one and nothing can ever take that away. You bear the light of Christ within you, never forget that.